Successfully Added NIA X5 Bluetooth Headphones - 40mm HD Drivers, FM Radio, SD Card Slot, Wireless Headphones-Red to your Shopping Cart. The NIA X5 Bluetooth headphones bring a superb sound without wires. 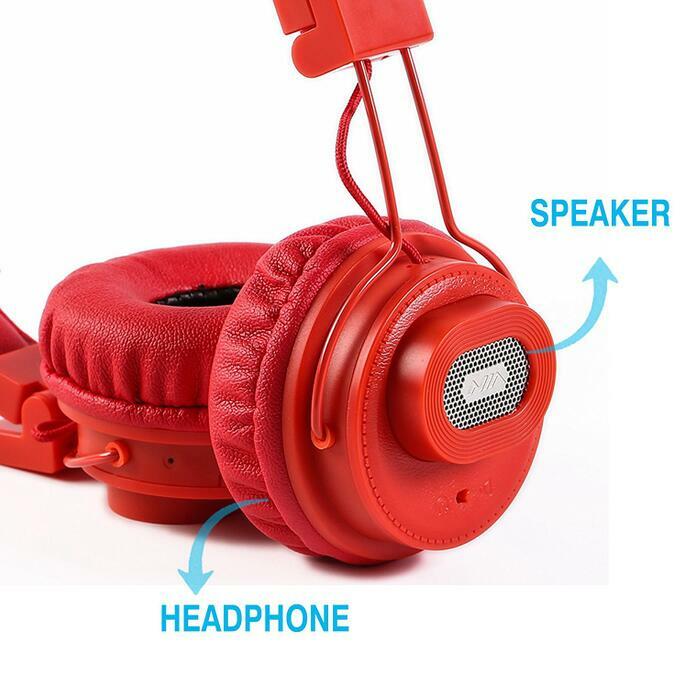 The over-ear headphones are really small and portable. They have nicely padded ear cups with flexible and adjustable angles that ensure a snug comfortable fit and the braided cables are resistant to wear and tear so they are suitable for everyday use. 40mm diameter high def driver units really pack a punch and deliver the incredible audio quality that's amazing considering these are cheap headphones. All the controls are easily located on the right ear cup so switching modes is quick and easy. Headphones and Speaker Switch Mode: You can either opt for normal audio player like conventional headphones, or instead use a pair of surround sound speakers to listen to music with them around your neck. 5 in 1 Function: Multi function for you to enjoy music like Headphone Speaker, Support Bluetooth, FM Radio, TF Card Play and Hands Free while running, cycling, climbing, and other forms of exercise. Comfortable & Portable: Lightweight(120g), wearing comfortable with the soft ear-pads and ergonomically designed head beam, foldable compact design suitable for daily use and outdoor travelling use. AUX and Bluetooth Mode: Both offer universal compatibility and the flexibility of going wireless when paired with Bluetooth enabled devices and the ability to turn the wireless headphone/speakerphone to a wired speaker or headphone via 3.5mm AUX cable. The X5SP headphones feature the latest Bluetooth 4.2 to offer a more stable and faster connection between devices. This technology creates lower energy consumption which supports 6-8 hour Bluetooth or 12-hour SD card media playback on a single charge. A built-in 240mAh battery can be charged in about 1.5 hours and will deliver as much as 6 hours of music depend on which play mode you use. A superb option that delivers quality sound and the best headphones for under $50 that you're likely to find.